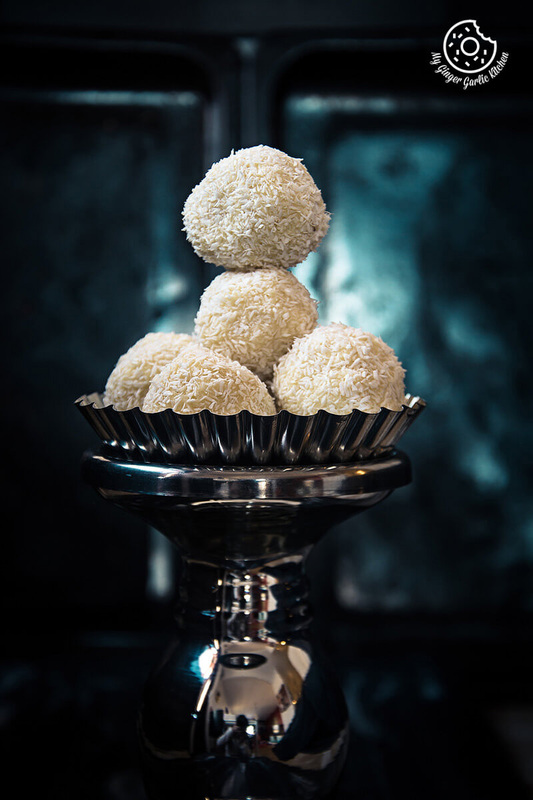 White Chocolate Coconut Truffles are silky, smooth, rich, creamy, luxurious, melt-in-mouth treats with coconut coating. 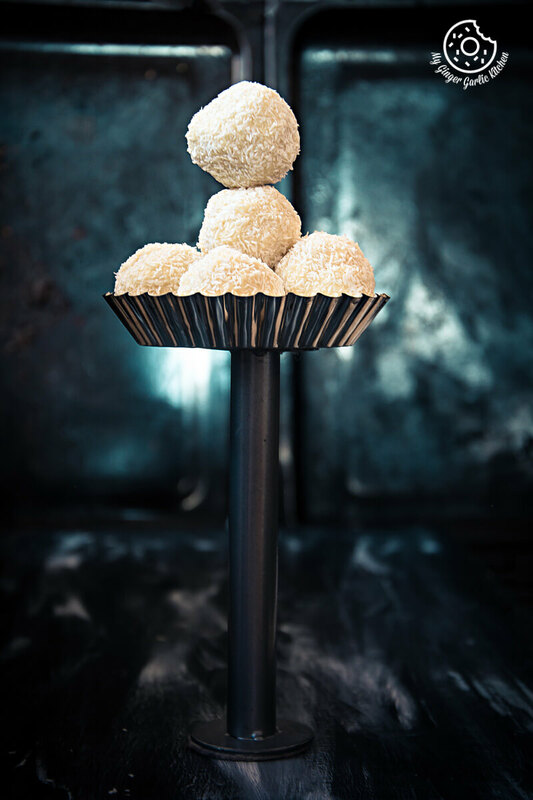 These coconut truffles with a seductive combination of coconut and white chocolate are easy to make at home. Can you believe these melt-in-your-mouth white chocolate coconut truffles are made from only 5 ingredients! Making these coconut truffles is a piece of cake. Can you resist this irresistible combination of coconut and white chocolate? I just can’t. These creamy white chocolate coconut truffles are quick and easy to make and make a perfect edible Christmas gift for white chocolate fans. Happy Children’s Day to you all. Because I believe every grown-up has a child-self which is often hidden somewhere deep inside. So let’s celebrate that child inside us and bring him/her out for today. To take this further, I have a set of questions for you today. Do you love white winter? Do you love white chocolate? Do you love coconut? Do you love truffles/snowballs? If you nodded ‘yes’ to any of the above questions then these truffles are calling your name. Calling out all the coconut lovers here. 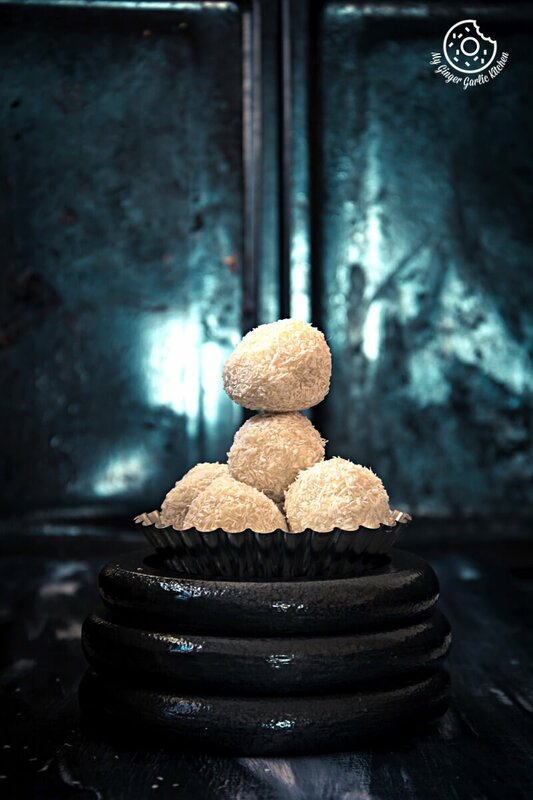 Coconut truffles, so smooth, delicious, melt-in-mouth desserts with coconut coating. You can make this simple yet exotic dessert by using condensed milk or milk powder and butter, or by using white chocolate as I do. White chocolate gives it a silky smooth texture and it tastes just delicious. How do these Chocolate Coconut Truffles taste? 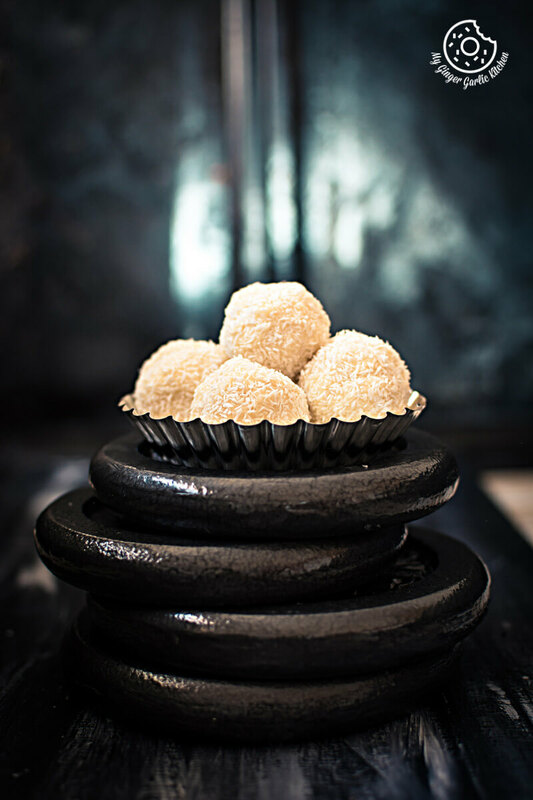 If there is any such thing as chocolate heaven then these quick and easy-to-make white chocolate truffles could be the best thing you will find there. They are so silky and so chocolate-rich. I love to use unsweetened desiccated coconut because it creates a perfect balance with the sweet white chocolate. 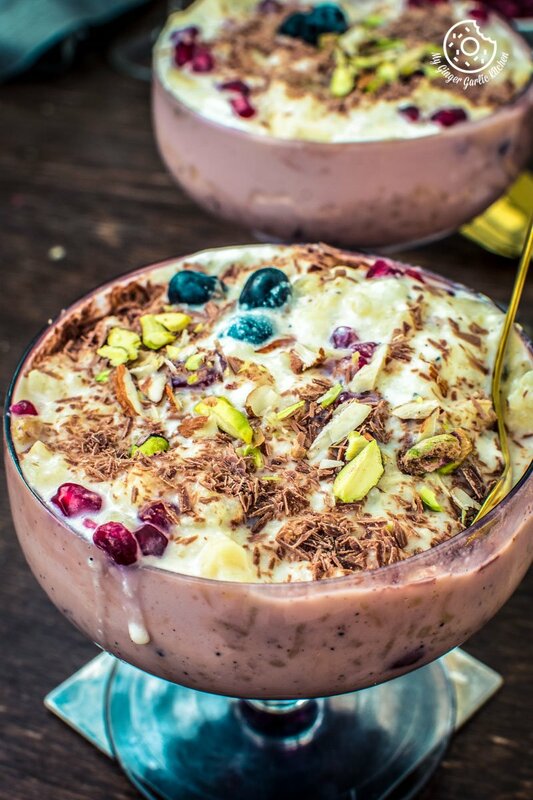 To make these, you just need to melt the mixture of chocolate and whipping cream, combine it with the desiccated coconut. Then roll small amounts into balls, stuff with nuts. 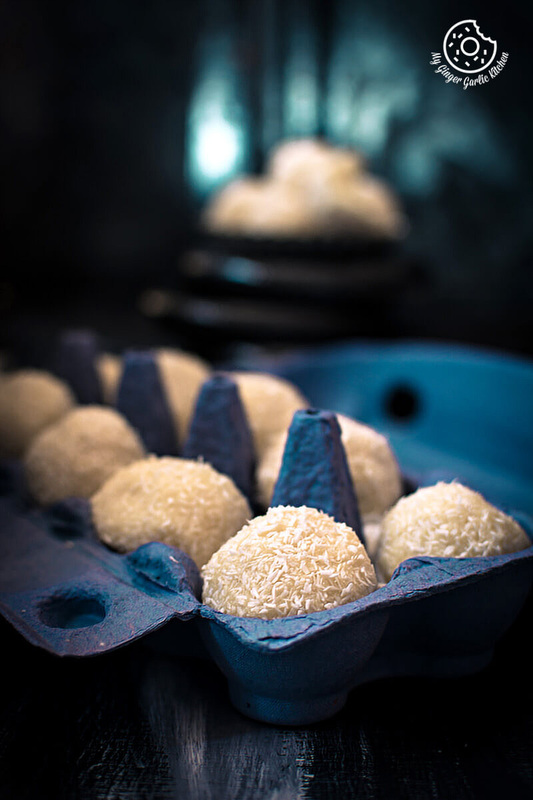 Roll again and dip in unsweetened coconut for that alluring snowball look. How Do you make White Chocolate Coconut Truffles Recipe? Prepare the mixture by melting chocolate and mixing dry ingredients. Refrigerate and quickly roll them into balls. Done. You can also add some coconut oil for that extra coconutty flavor. And they will not melt and will stay solid at room temperature. Else don’t use any oil and butter and keep them in the refrigerator as I did. White chocolate is more heat sensitive than the dark one, so don’t heat it on full power in the microwave for a long time. Start with 1 minute, then continue with 20-second intervals. Take it out from the microwave between each interval and stir to even out the heat. However, if you are not comfortable in melting chocolate in the microwave, then you can surely use the traditional way of a double boiler. These truffles can make a beautiful romantic dessert for the two of you. 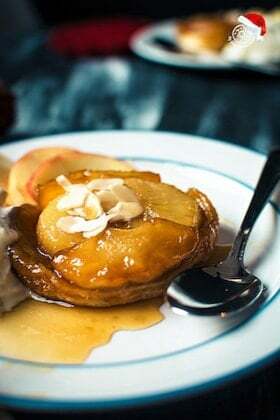 They can shine your holiday dessert with so much of elegance and wintery mood. Maybe you will prefer them wrapping into the holiday gift boxes because they will make a great homemade treat for any holiday season. 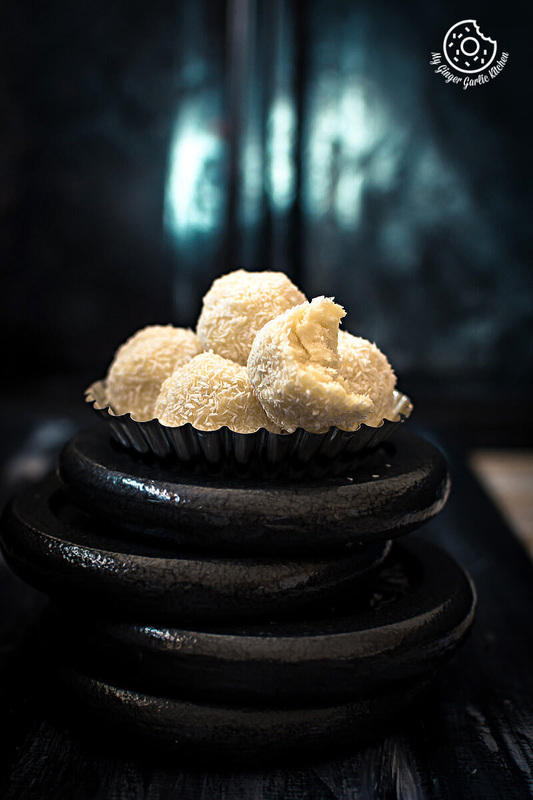 For making White Chocolate Coconut Truffles recipe, I have used desiccated coconut. Unsweetened shredded coconut helps in balancing out the already sweet white chocolate. However, you can substitute desiccated coconut with Unsweetened shredded coconut, or small flaked coconut. If you want to add a little booze to these truffles, then you can surely add about 2 Tbsp coconut liqueur, or coconut flavored tequila, coconut rum. Use the best chocolate you can find: Always use the best quality white chocolate you can get your hands on for this recipe. Good chocolate makes the great truffles, and they melt quickly and smoothly, taste delicious. Always grease your palms before rolling the truffles, it really helps in shaping if your palms are greased. If you roll them with non-greased palms, they get pretty sticky. White Chocolate and Coconut Truffles are smooth, flavorful, delicious and easy to make at home. 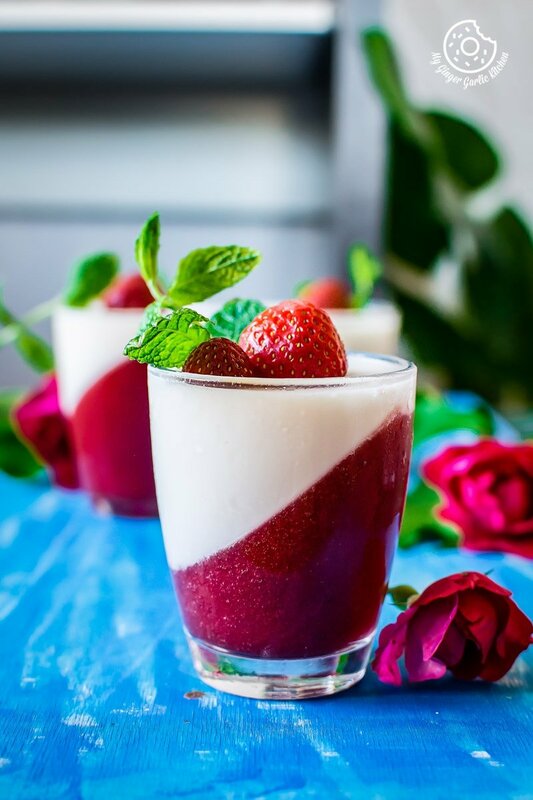 It is a perfect elegant dessert for a dinner in two, for holiday tables or friend gatherings and also can be a wonderful homemade gift idea. Everybody will love these, there is no doubt about that. 1. Microwave the chocolate at high for 30 seconds. Remove the bowl and stir. 1. Add 1 cup of water to a medium saucepan or pot and bring to a very gentle simmer. 2. Place a heat-proof bowl on top of the pan while making sure that the water doesn’t touch the bowl. 3. Stir occasionally with a spatula until smooth and melted. 1. Stir in 1⁄2 cup desiccated coconut and vanilla extract. 2. 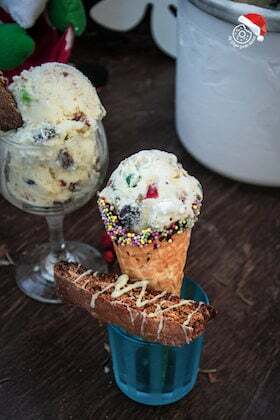 Let it cool completely. 3. Cover the bowl and chill in the refrigerator for 2-4 hours or until firm. 4. Take chocolate mixture out of the fridge. 5. Scoop out small sections and form them into balls, adding a nut inside. 6. 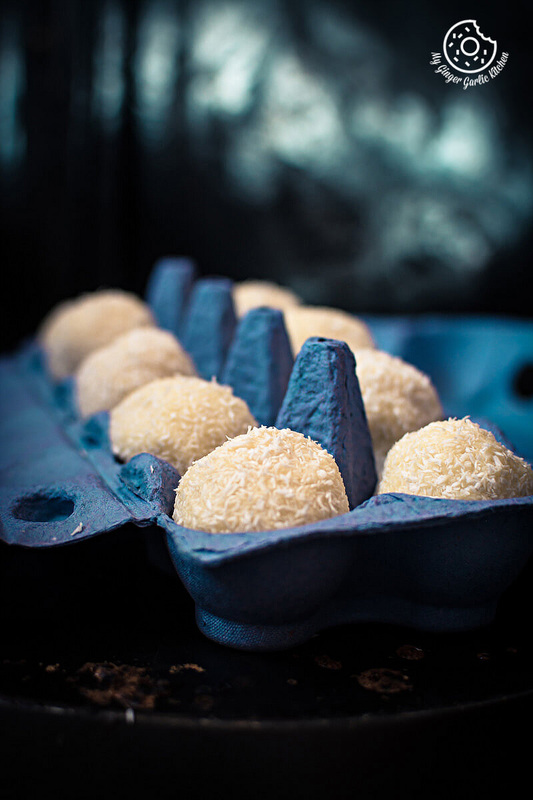 Roll each ball in coconut and refrigerate until firm. Serve chilled. 7. You can store truffles in the fridge in an airtight container for up 2 weeks. 1. Truffles can be frozen for up to a month. When you want to eat leave them in the fridge overnight to thaw.